and seal with a diaper pin! 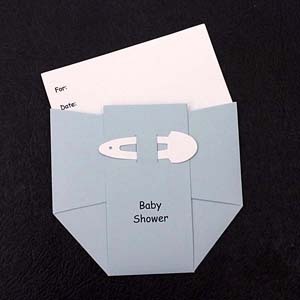 Suggestion: Slip directions to the baby shower inside the diaper! 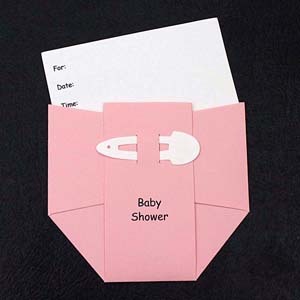 Pink Diaper Invitation with White Pin preprinted inside. The following entry spaces are pre-printed inside our invitations. Blue Diaper Invitation with White Pin preprinted inside. I received the diaper invitations and they way exceeded my expectations. Thank you for your professional handling of my order. I showed them already to the guest of honor and she absolultey thinks they are the cutest thing she has ever seen. I couldn’t have found a better diaper invitation. It’s perfect. Thank you so much. I was absolutely thrilled with the job you did on our baby shower invitations. I got many compliments on them, and they set the tone for a really fun party. All my guests loved them. They thought they were the cutest thing. They especially loved the fact that I could print them in Spanish for them. Thanks a lot. They’re adorable. I can’t stop showing them to everyone. Communication was great and made the purchase a smooth transaction. I spent time looking for exactly what I wanted, and you helped me find that. Thank you for the great service and for a wonderful product.